I'm supplying a local cafe and looking to expand slowly. My local council wants me registered with them and has supplied me with the following labelling laws/guidelines (can't decide if it's one or the other) for my packaging. The council haven't said they all apply but have intimated this is the labelling law I have to comply with. Are you supplying products intended to be on-sold to retail customers? Or just supplying beans that will be used in making coffee on the premises of the local cafe? Interesting question Barry. 99% used in the making but they also want to onsell. Of course they want you registered Luke!! :-) It means more money for their retirement fund! 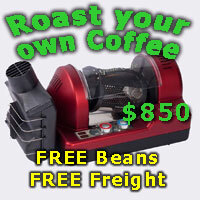 Coffee roasting is low risk so you shouldn't be any higher than a cat.3 food production. Watch their compliance regs tho', they can ending up costing a packet...plumbing, h&c water, lined or sealed walls and sealed floors. Registration costs me almost $400 p.a. Labelling? Business name, weight, contents and roast date on front of bag. Business address and 'best enjoyed within 4 weeks of roast date' on the back satisfies my council well. I wouldn't worry about nutritional info or a warning label (as you don't process any other foodstuffs). Product liability insurance is probably a good idea. When I have my annual inspection, I generally get someone different each year which can be problematic but they get all excited when I show them hundreds of old roast log files in a folder on the computer and give them full provenance on most of my coffees. Don't forget to tell them that coffee is naturally vermin proof! The compliance regs are the killer. I was planning to roast in a shipping container but they want it fully lined which will cost a bit! Ah well. Costs of starting a small business I guess. Thanks for the advice chokkidog will get there slowly.